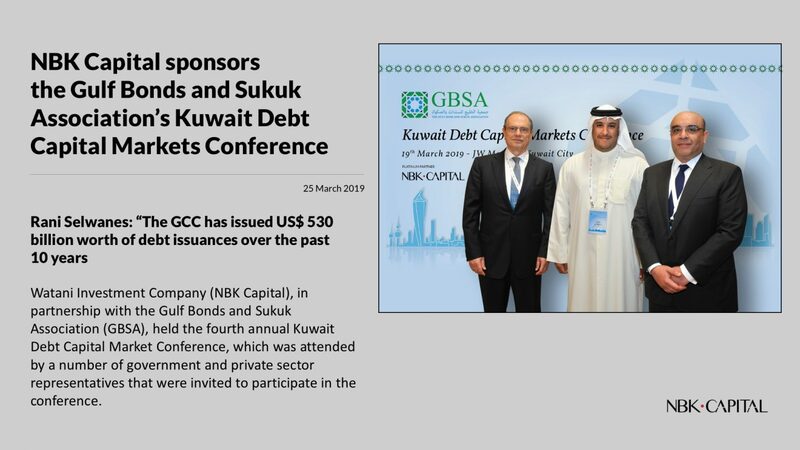 Watani Investment Company (NBK Capital), in partnership with the Gulf Bonds and Sukuk Association (GBSA), held the fourth annual Kuwait Debt Capital Market Conference, which was attended by a number of government and private sector representatives that were invited to participate in the conference. He further explained, “The average annual issuance volume in the GCC has more than doubled over the past three years to US$ 81bn, compared with its US$ 36bn historical average between 2009 and 2015; and that with this increase the region has leaped into a new level of market maturity rivaling that of its emerging market peers. Mr. Selwanes also spoke of the importance to support local and regional Kuwaiti government issuances to further develop Kuwait’s sovereign yield curve, an important benchmark that guides the pricing of issuances by Kuwaiti companies and institutions. He explained that “With the prospects of recurring sovereign issuances by the State becoming lukewarm, perhaps it is time to consider taking prominent Kuwaiti government related entities to market as an alternative to a purely sovereign yield curve”. Later on during the conference, Mr. Zaid Al-Sager, Director – Investment Banking participated in a panel discussion on the state of Kuwait’s debt capital markets, along with a group of other leading professionals in the local debt capital market. The panel collectively discussed the need for the further diversification of issuers in the local debt capital market. Mr. Al-Sager further noted, “There has been an increasing interest amongst both government related entities and prominent Kuwaiti conglomerates to obtain credit ratings as a first step towards their potential participation in the debt capital markets, which is a positive indicator for the potential to further diversify and grow Kuwait’s debt capital markets”. During the Kuwait Debt Capital Markets Conference, Dr. Saade Chami, Group Chief Economist at National Bank of Kuwait highlighted the synchronized slowdown in major economies and expected the global growth rate, which was lowered by the International Monetary Fund (IMF) to 3.5% in 2019 back in October, to be revised downward again as risks have tilted to the downside. Dr. Chami added that GCC region would likely be insulated from the global slowdown due to its limited integration with the rest of the world in terms of trade. The impact will come mainly through oil demand and oil prices–which he projected to hover around current levels–and interest rates which are expected to remain unchanged given the Fed pause on rates hikes. “GCC growth expected at around 2% in 2019 driven mainly by public spending while non-oil activity seen at 3.0 %. Oil sector growth would be about flat due to OPEC’s decision on production cuts” he pointed. He also pointed out that there is a greater need for debt issuance in 2019 due to moderate oil prices, more relaxed fiscal policies, and large part of public debt maturing. Finally, Dr. Chami stressed that GCC sovereign debt issuance could reach about USD 50-60 billion this year but this is subject to uncertainty related to oil prices and budgets implementation, adding that Saudi is expected be the largest borrower in 2019 with an estimated issuance of about USD 30 billion. The conference offered a variety of presentations; Standard and Poor’s credit rating agency presented and discussed the process and criteria for obtaining a credit rating. Acreditus, a regional advisory firm, concluded the conference with a presentation on the potential applications of Blockchain technology for sukuk issuances.